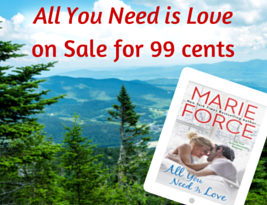 ALL YOU NEED IS LOVE, Green Mountain Book 1, is on sale for 99 cents! If you haven’t yet started my New York Times bestselling Green Mountain Series, this is the best time EVER! (Can you tell I’m excited about this?!) Come to the mountains of Butler, Vermont to meet the Abbott family—and a town moose named Fred who has stolen the hearts of readers. If you love SIZZLING romance and big families that live and work in small towns and books with more than 500 five-star reviews, you’ll LOVE the Green Mountain Series!